In 2014, traffic fatalities dropped to an all-time low - the lowest number ever seen since record keeping first began in 1975. Unfortunately, this trend has not continued, as it is estimated that auto accidents and traffic fatalities have significantly risen over the past year. In fact, The National Highway Traffic Safety Administration (NHTSA) has estimated an 8.1 increase in traffic fatalities in 2015. Pedestrian and bicyclist accidents and traffic deaths have also increased by more than 14 percent in 2015. Due to these startling statistics, The Department of Transportation is now focusing on a special campaign to improve pedestrian and cyclist safety. Mark Rosekind, an NHTSA administrator, feels the epidemic of traffic fatalities in 2015 is simply unacceptable. He plans on holding meetings in major cities such as Denver, Atlanta, Sacramento, Dallas and Boston, to discuss ways to combat unsafe driving practices. Rosekind believes the NHTSA should focus on Behavioral Safety Programs to help improve human error while driving. Such programs involve the use of behavioral science to understand and change erroneous human behaviors. Currently, many accident-related fatalities are the result of distracted driving, as drivers continue to use their cell phones while behind the wheel. Such behavior takes a drivers focus away from the roadway and can lead to an increase in car crashes and traffic fatalities. Drunk driving is also a concern, as it is the number one culprit behind one-third of all traffic deaths. Drug use, drowsy driving and unbelted vehicle occupants also have resulted in numerous roadway tragedies. 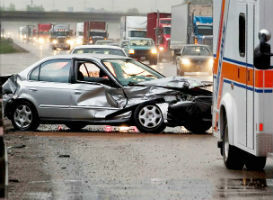 At Phillips Law, we believe you deserve justice for injuries caused by a negligent driver. Contact our car accident attorneys today for a free consultation. Our injury lawyers can help and support you in your personal injury case.